I’ve been pointing out for several months now that the recent rally in the dollar was a mirage, an illusion generated by the yen, euro, pound, and Canadian dollar all dropping into yearly, or intermediate cycle lows together. This selling pressure in the four major currencies that make up the dollar index spawned what looked like a strong dollar. With Bernanke printing 85 billion of them a month, there is no such thing as a “strong dollar”. I’ve been saying for months that once these four currencies completed their bottoming cluster it would be the dollar’s turn to crash. The recent collapse in the yen was 23%. The Pound 9%. 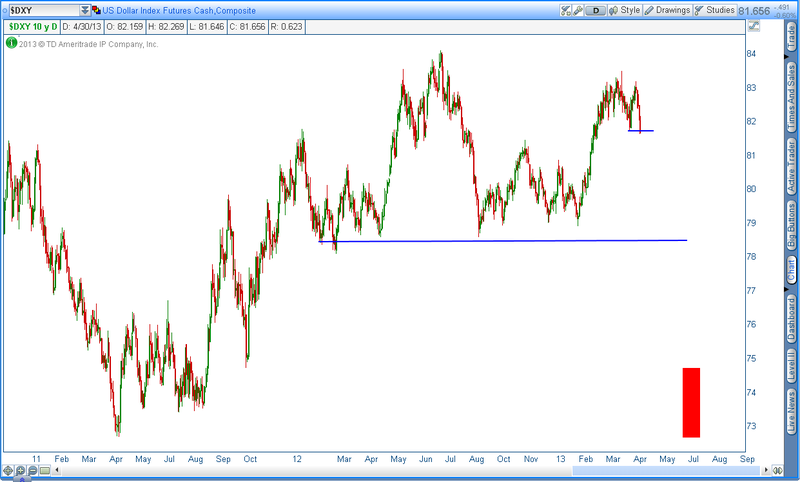 I think the dollar will be somewhere in between with a loss of 9-12% as it drops down into it’s yearly cycle low. As this process starts to accelerate over the next couple of months the dollar bulls are going to get a rude awakening, as our currency shows it’s true colors. The acceleration began today as the dollar has now completed a lower low and a lower high. Once major support is breached at 78.50 there will be nothing to stop, what I think will be a waterfall decline, until the dollar reaches the 73-75 zone. And don’t forget this is just the beginning. The much larger degree, 3 year cycle low, isn’t due until late next year. It’s time for the unintended consequences of QE infinity to come home to roost. This should drive either another C-wave in gold. 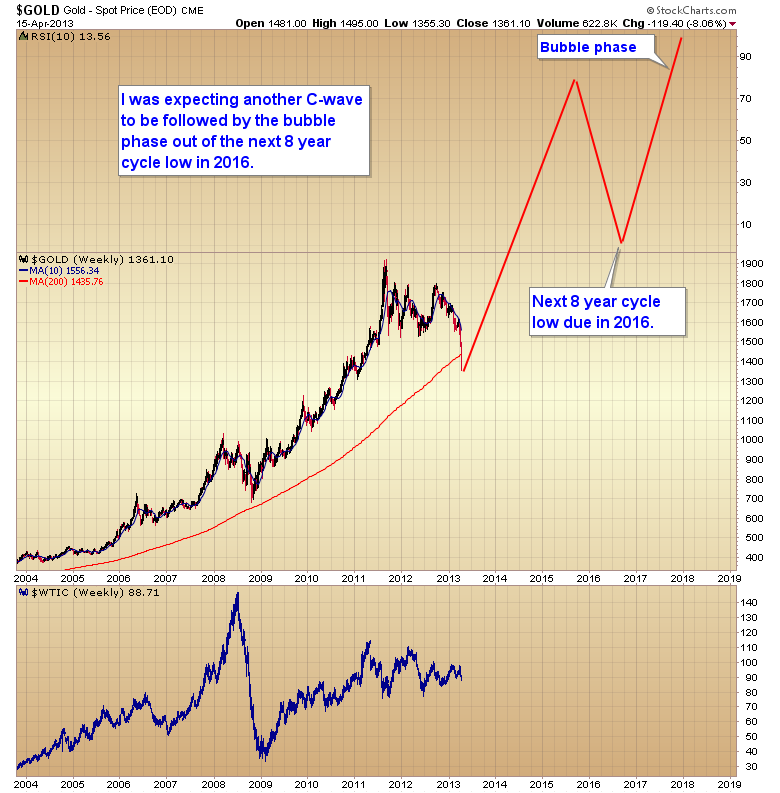 Or as I’m now starting to believe, gold may be in the initial stage of the bubble phase of the bull market. 2015 will be 15 years. That’s about a normal duration for a secular bull run. Let’s face it, commonsense would tell most people that you can’t just print 85 billion dollars a month and not have something bad happen. The last time the Fed embarked on this kind of insane policy it was during the real estate bubble implosion. Instead of rescuing the housing market the Fed drove oil to $150 a barrel and spiked food prices around the world, triggering riots and wars in many third world countries. I expect the same game plan this time is going to reap the same results. We have all the ingredients in place. 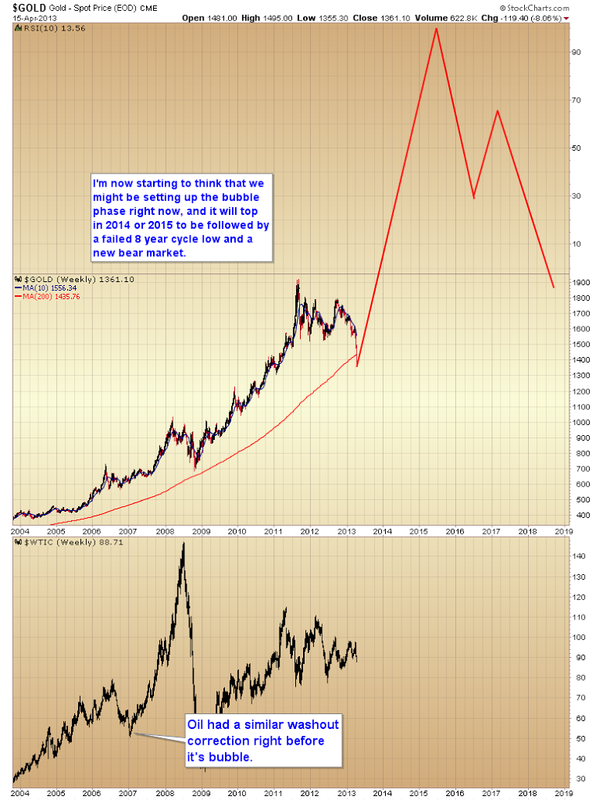 Gold has probably completed it’s yearly cycle low. The COT is showing a max bullish position by commercial traders. Before every bubble phase there is always a devastating correction that convinces everyone that the bull is over. I would say that describes pretty much what has happened over the last 6 months. And to top it all off the recent manipulation to run the stops below $1523 has triggered massive shortages in the physical market, especially in silver. Now add to that a collapsing dollar over the next year and a half and everything is in place for gold to generate at the very least another C-wave advance and in my opinion we probably have the conditions necessary for the bubble phase to begin. This entry was posted in Uncategorized on April 30, 2013 by Gary. This entry was posted in Uncategorized on April 18, 2013 by Gary. Just another quick post tonight. As I have been saying for over a year now, the dollar will not make new highs, and it will collapse as the consequences of QE infinity ultimately take their toll. As I’ve been saying for months, the dollar rally was a mirage. 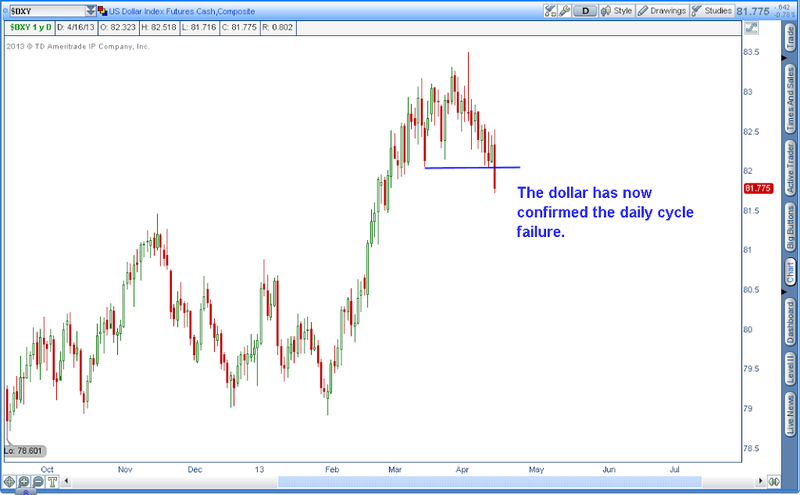 The only reason the dollar index was strong was because the yen, euro, pound and Canadian dollar were all moving down into intermediate or yearly cycle lows together. That gave the illusion that the dollar was rising. The dollar was simply benefiting from people selling everything else. But now it’s the dollar’s turn. Let’s face it, in the real world you can’t print unlimited amounts of money and not have something bad happen. The real world just doesn’t work that way. Maybe in fairy tale land were magic works, but not here in the real world. Over the next 2-3 months we will see the dollar drop down to, and I fully expect it to crash through support at 78.60, and maybe even test the 2011 lows. Of course that is only the beginning. Before this is done we will have a full blown currency crisis in the US dollar at the next three year cycle low that is due in late 2014. Who knows how much damage will be done during that catastrophe. 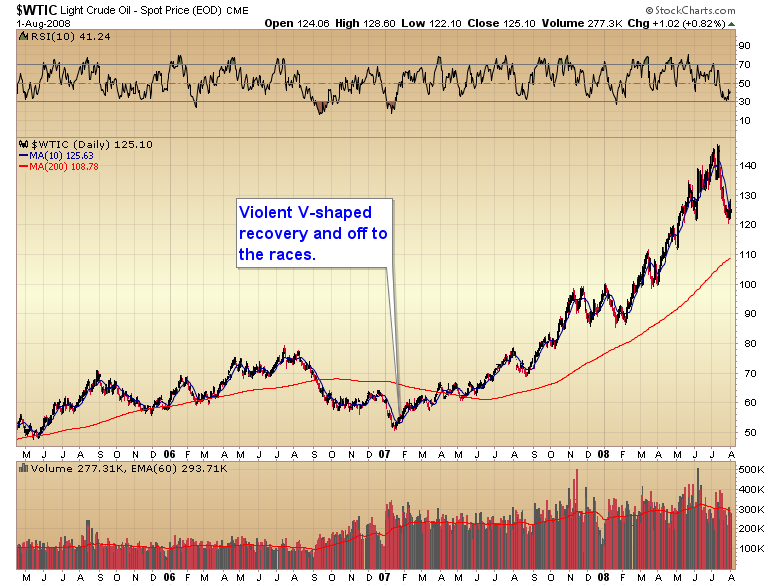 I expect we will see something similar to what is happening to the yen right now. As a matter of fact the yen is only the first of what will almost certainly be a rolling crisis as the cancer works it’s way up the food chain from the yen, to the pound, and finally the dollar. Brace yourself folks, it’s time the lipstick comes off this pig, and it ain‘t going to be a pretty sight. This entry was posted in Uncategorized on April 17, 2013 by Gary. SETTING THE STAGE FOR THE BUBBLE PHASE? I’m starting to think that’s what is transpiring in gold right now. We are in the washout phase and once the bottom forms gold will launch straight into the bubble phase over the next year and a half/two years. That will necessitate a rethink on how the next 8 year cycle is going to play out. Instead of the eight year cycle low generating the bubble as originally expected, it will signal the end of the secular bull market. This entry was posted in Uncategorized on April 16, 2013 by Gary. Everyone is focused on gold. What they should be focusing on is the stock market. This entry was posted in Uncategorized on April 15, 2013 by Gary. We are now at the point in the bull market where traders think that stocks are bullet proof. Back in December I warned this was coming. I said at the time that this round of QE was going to be different. That it would have a much bigger effect on the market than the analysts were expecting. I remember at the time analysts were claiming each round of QE was having less and less effect. 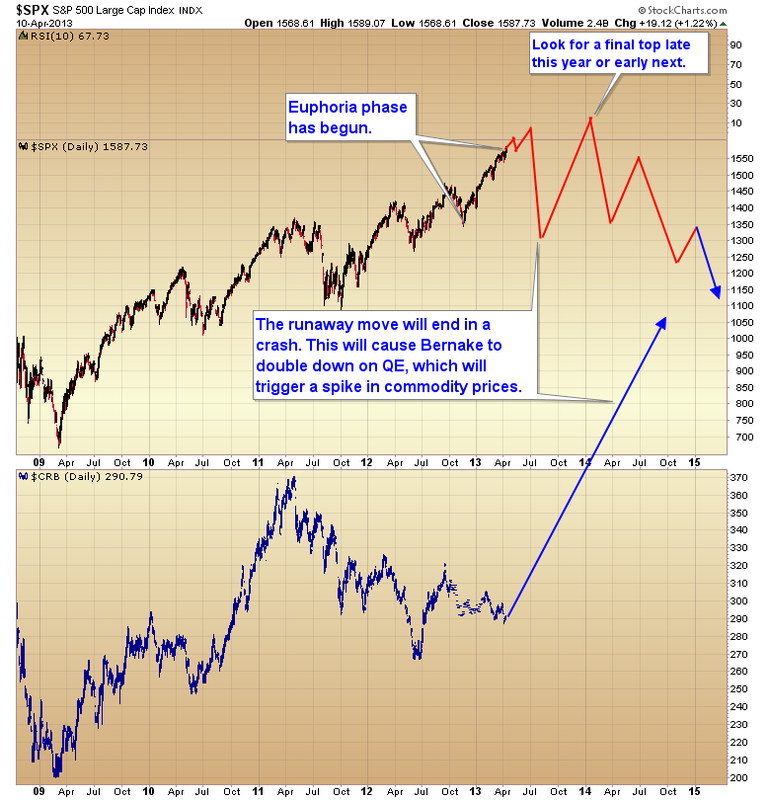 I was confident that QE3 & 4 would usher in the euphoria phase of the bull market. Actually Bernanke is putting in place the final components to bring about the end of the bull. Let me explain. QE infinity has, and is generating a runaway move in the stock market. The problem with a runaway move is that it’s artificial. Let’s face it anyone with a shred of common sense knows what’s driving this move and it isn’t the economy. Bernanke is crazy if he thinks the stock market is acting normal. Well this is the guy that said the subprime crisis was “contained”. Any artificial move is destined to end badly, just like the artificial housing market ended badly. The problem with runaway moves is that they stretch way too far above the mean in both price and time. As this process progresses institutional traders become more and more nervous, so the market becomes more and more shaky. Kind of like a heavy snowfield just waiting for that last snowflake to turn it into an avalanche. And that’s exactly how these runaway moves end. At some point all of these nervous investors try to get out the door at the same time, and you get a crash or semi crash. My best guess is that it will come in June or July. 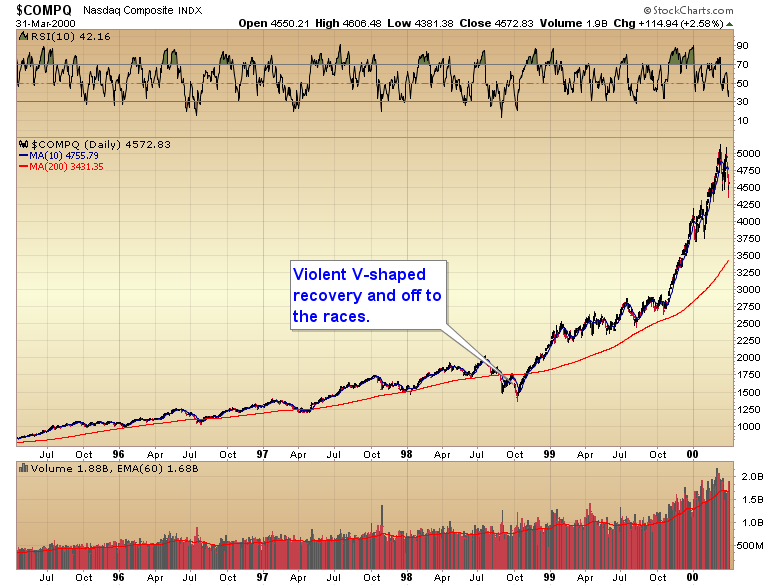 Until then the market will probably continue to creep higher with occasional 40-50 point corrections. That’s another characteristic of runaway moves. They set a standard correction size early in the move and all corrections there after fall in the range. Then at some point one of those corrections spikes through the range and months of gains get wiped out in a matter of days, or even minutes. The flash crash in 2010 is an excellent example of a runaway move crash. So here’s what I think is going to play out. Unknowingly Bernanke has put in motion a runaway move that will end in some kind of crash this summer. Depending on how long and far above the 200 day moving average this thing stretches will determine how violent the crash will be when the forces of regression take over. If this lasts till summer like I think it could then we could see a crash of 15-20%. When that happens Bernanke is going to freakout and crank up the printing presses even faster. 85 billion may become 150 billion. When that happens commodity markets are going to go crazy just like they did in 07/08 as Bernanke tried to print away the real estate implosion. When commodity prices spike, economies collapse…just like they did in 2008. All the pieces are starting to fall into place. QE infinity is driving a runaway move in stocks that will end like all runaway moves, with some kind of crash scenario. That will trigger even more printing which will spike commodities next year, and that will be the end of the economy and the beginning of the end for this stretched and extended cyclical bull market. Look for a final top late this year or early in 2014 and a very extended topping process as the fundamentals slowly overwhelm Bernanke’s printing press. This entry was posted in Uncategorized on April 11, 2013 by Gary. 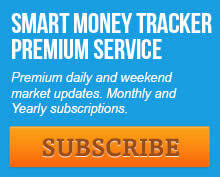 For a one week trial subscription to the SMT nightly newsletter click here and then click the subscribe link. This entry was posted in Uncategorized on April 4, 2013 by Gary.